QuranReflect is still in early beta so sharing is not available. QuranReflect – Reconnect with the Quran, Share your experience! Bring the Quran back into your life with QuranReflect, the world’s first social network for encouraging and facilitating Quranic reflections. Help us revolutionize the way people interact with the Quran by becoming one of our first supporters! We spend hours on social media glued to our smartphone screens oftentimes at the expense of reading and internalizing the lessons of the Quran. 74% of Facebook users, 63% of Snapchat users, and 62% of Instagram users visit these platforms on a daily basis, with the majority multiple times a day. We know that we should turn to the Quran to find comfort, inspiration, and to cope with life, but in today's fast-paced, distracted induced way of life, rarely does this happen. QuranReflect gives you the opportunity to reconnect with the Quran without having to leave your screen. While the times have changed, the way we interact with the Quran has not. We have the internet, smartphones, and hundreds of apps, but the Quran remains a book that sits on the shelf. It is time for a social network that leverages latest technology trends to reduce the friction between us and interacting with the Quran. Make the Quran Relevant Again. See reflections on current topics live. Search hashtags and see what verses and reflection were written about these topics. Anyone, Anywhere. Most of the commentary on the Quran is written by scholars who have years of traditional Islamic studies. Whether you are a scholar, economist, student, doctor, bus driver, etc, your life experience and knowledge shape how you interpret the Quran. With QuranReflect, everyone’s reflections count and everyone’s reflections matter. Permanent Home for Your Reflections. Some people share their reflections on the Quran via Facebook and other social media platforms, but these posts disappear quickly and are not easily found later. With QuranRefect, any reflection made on a verse is always connected to that verse, and reflections on verses can even be viewed by popularity. We created a website prototype which we shared with some content creators who are creating Quranic reflections. Alhamdulillah, they love the application and are continuing to post on QuranReflect. We are also working on creating partnerships with Islamic Institutions who are working in the Quran space. 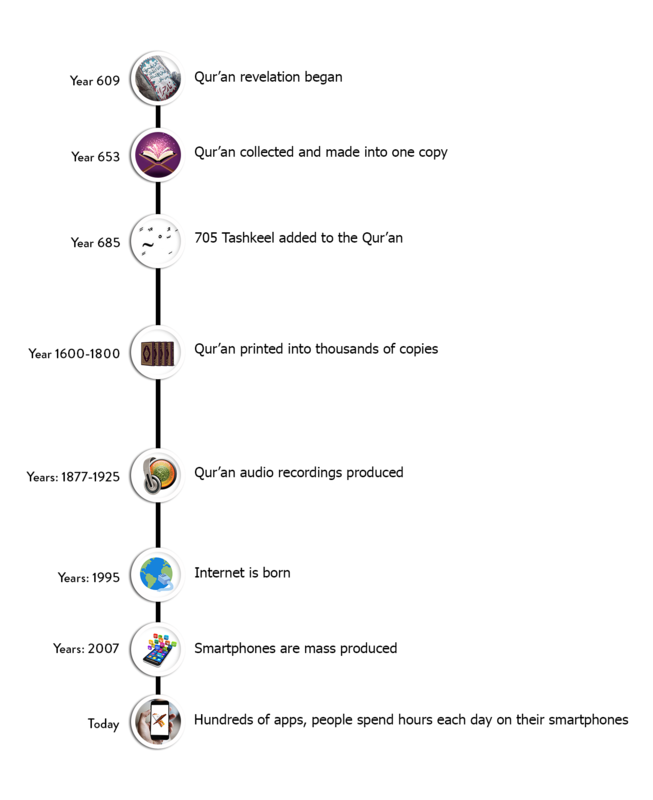 We have invested hundreds of hours to get QuranReflect to the point it is now. 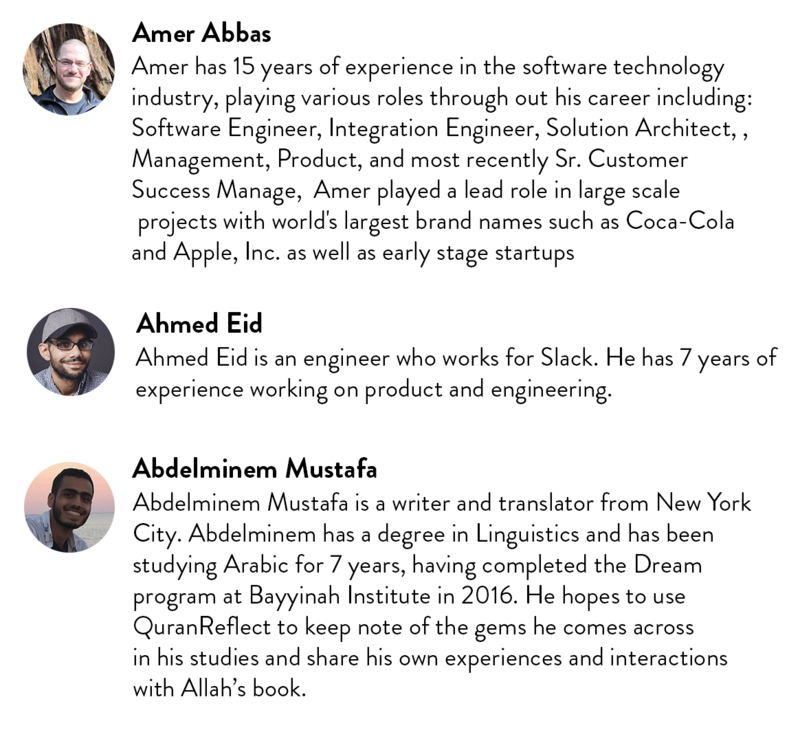 From hiring engineers to connecting with North America’s most prominent Islamic scholars, we know that QuranReflect has the potential to completely change the way people interact with the Quran. Whether you are new to the religion and have just started on this journey, or you have run Quranic study circles, QuranReflect will have something to offer you. 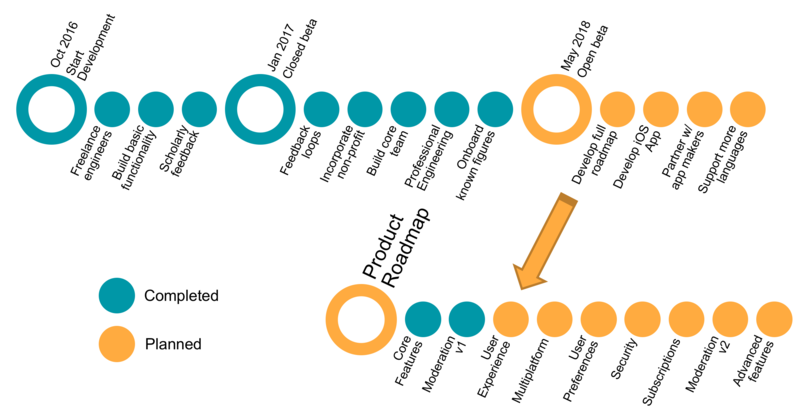 We have built a working prototype of the web application, but need your help to bring this to production. We also need your help to build the mobile applications. With your help and support, we can see this idea through. Together we can revolutionize the way Muslims interact with the Quran. Easy-to-use editing & publishing tools. Write your reflections, and save them for private reference, or share them in a private group or publicly. Reference and cross-reference Quranic chapters, verses and hashtags in your reflection. Read and interact with public reflections. Powerful search: Find reflections by chapters, verse number or range, verse text, authors, and hashtags instantly. Groups: Private spaces for your family, school club, or study circle/halaqa.